Rachel is a power house of enthusiasm! She has bags of passion and is driven to enable people to be the very best they can be. She has ten years’ experience working in the public and private sector, creating and developing successful teams. As an individual she has an enormous amount of energy and lights up any room, including all the people in it! She is someone who will challenge your thinking, encourage you to look within yourself, face the real you and build a plan to help you achieve your dreams. Rachel is your perfect partner. Fun, energetic, inspiring and above all genuine. She possess a wonderful skill of encouraging people to want to remove their masks. Working with organisations, she has helped increase turnover, improve productivity, motivate and boost morale, in turn reducing absenteeism. A qualified performance coach, practitioner of NLP and team profiling for Belbin’s team-roles. 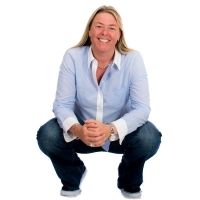 She specialises in team and individual enhancement through increasing morale, improving business relationships and breaking down barriers between work colleagues. With international experience, working with a variety of industries and organisations on developing individuals and teams. Rachel’s programmes are delivered in an experiential way to get the best desired outcome, doesn’t matter what your learning, she’ll will create, a creative fun and engaging way to do it!